I really wanted to love this one. So many people - of all ages - extoll it's virtues. They say, forget the price and just go for it. It's a great foundation that will give you an airbrushed finish etc, etc, etc. It makes me sad that I just don't feel the same. At all. So let's rewind and start with the premise of this first: it's a hybrid product, part medium coverage foundation and part wrinkle control serum. The packaging talks about something called Mimetic Factor which I can't even pronounce let alone comprehend but it's something to do with a "complex" that evens out skin tone, adding a youthful radiance while still maintaining a natural, matte finish. I believe this is the improved version of the long discontinued Lumiere Veloutee - a foundation that reportedly blurred out imperfections. There are 10 shades in the range and a variety of undertones - something that makes online ordering almost impossible because the differences between them are subtle but important. I got number 7 - Golden Beige - which is around the NC25-NC27 mark. I paid an extortionate amount of money in Sephora for it - it's priced at £75 in the UK - and toddled on home to road test it. 1) It has a very By Terry scent - I love this fragrance as it's a sweet rose/floral but I can imagine this getting on the nerves of those more sensitive. For reference it smells exactly the same as Cover Expert. 2) The packaging is luxe - ...and it bloomin' well should be! It's a glass bottle with a pump that makes for neat dispensing of the product. ...and that's where it all went wrong. Now admittedly I like a glowy finish by choice but I am not a stranger to a good matte. Chanel Mat Lumiere, By Terry Cover Expert and MUFE Mat Velvet+ are all foundations that I love. They give a delicate matte finish that controls oil but still manages to give a soft, airbrushed finish. Densiliss isn't anything like that on me. It manages to make my skin look flat, dehydrated and also highlights every single fine line that I own. As a result of that it's very visible on my skin in the least flattering way possible. I have tried playing around with it - using without powder, mixing it with MAC Strobe Cream (better I have to say) and using different amounts/tools to apply it. But whatever I do, I end up hating my face. I do put my hands up and concede that it was my mistake to buy this on blind faith. I got so revved up by positive reviews from well-known bloggers that I assumed it would be great so when I was in store and feeling reckless I decided to just go for it - especially when the colour match was so spot on. In experiencing this #fail I have been doing some thorough review reading and it's completely polarised - some HATE it and some absolutely love it. There must be something I am missing here. Please tell me you photoshopped the 'Terrybly' on the bottle? FRIGG ME! How did I miss that? Thats such a great pun opportunity! I LOVE this foundation and here in the states we pay $115 for it. When I had samples shipped to me, they shipped a primer to try with it and I believe that was the key. It works fabulous with the By Terry Hyaluronic Hydra-Primer and it also works great with the It Cosmetics "Feel the Moment" primer serum. (You should try It Cosmetics CC Cream if you are looking for luminous! It is a sheer-medium finish but it is gorgeous!) 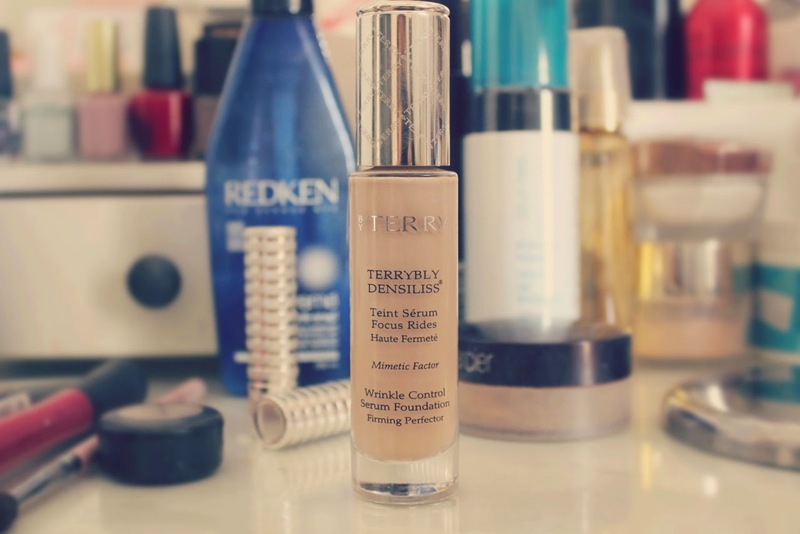 The by Terry Serum Foundation does NOT work well with a silicone primer. I hope that helps! Good Luck! I did buy this foundation a while back, and whilst I was a little disappointed that it wasn't as 'amazing' as everyone made it out to be, I don't dislike it either. I feel the same way about this foundation as I do with Giorgio Armani Luminous Silk, another foundation I believe is over-hyped. When I apply it it looks gorgeous and definitely gives an airbrush finish, I find it's best when you use a very small amount though and I apply a little on the back of my hand and then dab a Sigma F80 into it bit by bit and blend thoroughly. I apply a teeny bit of powder in the t-zone to set and it does seem to last pretty well and creates a nice finish but it's nothing special (and most definitely NOT worth the £75 price tag) as for lines and wrinkles, after lunch, these are definitely visible and this is my biggest annoyance with this foundation, it feels almost 'drying'. I've been wearing Bourjois Healthy Mix Serum foundation today and I can honestly say that it's a better foundation, and that just about sums it up really! What do you do with items like this when you have invested then hate it? Would you give it to a friend or just bury it in your draw? :-( disappointed for you, but I have sometimes had issues with my foundation if it reacts with my moistuiser i.e. Garnier & Estee Lauder Double wear bobbles up. So I swapped to Liz Earle and its perfecto now. £75 for a foundation and for it to then turn out to be disappointing must be a killer! Your husbands description is hilarious though, can think of it for so many bad foundations I use. Oh gosh that is a lot to spend on a foundation and not like it :( Hope you can figure a way to make it work! wow, what a shame! I was curious about it because Amelia Liana loves it but I think I'll stay away. For £75 it should be amazebonks one everyone!!! Gosh, I would be so distraught over spending that kind of money for a product that doesn't do what I want. I'm always afraid of matte foundations for that very reason. I feel as if I will look cakey, grainy, or some variation between. £75 on something like this makes me want to cry. I'm all for spending money when it's worth it.. but ouch :( Such a shame as I've only been hearing good things about this brand (all aspects of the range) so a bit crap to hear it has some cracks! can't stress enough how important it is to try a sample before buying, even when you are #feelingspendy! next time ask for a sample with your purchase if you just couldn't bear to leave the store empty handed and try the sample first, that way you can still return or exchange your product if you decide not to like it. as for this foundation, i find that the better your skin is, the more it compliments it. its winter here in Australia so if i haven't exfoliated or done a facial/mask this foundation highlights the dry patches and uneven texture of my skin. but if i just did a moisturizing mask the night before, this foundation makes my face look like a babys bottom. i feel this is the same with my dior capture total serum foundation. so maybe these hybrids have a tendency to be like this :\ i still love this foundation none the less. I'd cry if a £75 foundation didn't work for me. Can you go back to the counter and ask how they could get it to work for you? Ha ha they barely have a clue on how much change to give back to you. Sometimes they dont excel in that even! That price tag is a huge deterrence from purchasing and I like high end foundations. The most I have ever spent though was on the YSL Le Teint Touche Eclat Illuminating. I honestly love it though. I had the same experience with Terry Sheer Expert - so weird how most of the highest end make up ranges can't produce a decent foundation? Thank goodness for Giorgio Armani! I was so tempted to buy this foundation and I'm very glad you saved me the money! It sounds like a foundation that never melts into the skin. Does it show up dry patches too? That is my biggest test for a foundation. Again thank you for this post! Oh my goodness, what a shame. I'd literally cry if I spent that much on a foundation and it looked like sand on a wet face! Great review by your husband - I should get my boyfriend to give a few quotes for my blog, could be interesting! although this post is a very sad one (for obvious reasons), your Husband's review on the product made me laugh!! I am not sure if it is because it is more matte in comparison to my usual bobby brown skin foundation, and I also find it a bit powdery and with an odd visible finish. The SA advised me to just use a tiny amount (2pumps) and really blend well. But the coverage is then patchy. I may dig it out from it's hiding place (where I'm not reminded of its price!) and give it another go with a damp beauty blender. I feel so bad for you!! After spending so much! Eeppp! Have you tried using a different moisturiser under it? I've found that sometimes I hate a foundation but when I try it again a few months down the line with a different moisturiser underneath it sits on the skin differently. I've not tried this foundation so I can't say it's true of this one but it's worked for me with others so maybe worth a go? All the best! oh dear, how 'terrybly' frustrating! Seriously thought that was a joke on the bottle!.